Dark Souls Remastered is releasing for PS4, Nintendo Switch, Xbox One, and PC. Here's all the info, including the Dark Souls Remastered reviews, release date, price, graphical enhancements, and new features. Dark Souls Remastered is coming to Nintendo Switch, PS4, Xbox One, and PC, with new graphics, enhanced features, and more. If you want all the info on Dark Souls Remastered, then we've got it. Read on for the Dark Souls Remastered release date, info on Dark Souls Remastered gameplay tweaks, Dark Souls Remastered reviews, price, frame rate, resolution, and more. Will Dark Souls Remastered run at 4K? We've got the details direct from Bandai Namco. This is everything we know about Dark Souls Remastered PS4, Switch, Xbox One, and PC, including all changes that have been made to Dark Souls Remastered. Dark Souls Remastered is finally here, so reviews for the graphically enhanced game are now in the wild. We've rounded up all the most important Dark Souls Remastered reviews and put them just below. It certainly looks like Dark Souls is still a great game. Dark Souls Remastered Review - IGN - 9.0/10 - "Now that Dark Souls Remastered exists, there's no reason to play any other version, whether this is your first run through or your 100th." Dark Souls Remastered Review - Game Informer - 8.75/10 - "For those new to the series, you can expect a captivating crawl through a mesmerizing dark world, full of unforgiving encounters, majestic foes, spectacular loot, and beautiful environments." Dark Souls Remastered Review - Trusted Reviews - 4/5 - "The term 'Remastered' implies that a great amount of work has gone into this release, and although it's a definite improvement – especially with regards to the frame rate – it isn't extraordinary." Dark Souls Remastered is coming to Switch, PS4, Xbox One, and PC, but when will you be able to play it? Bandai Namco has announced that the Dark Souls Remastered release date is May 25, 2018 for PC, PS4, and Xbox One. To mark the release of Dark Souls Remastered, Bandai Namco put together a launch trailer for the game, which you can see just below. Dark Souls Remastered releases on PS4, Xbox One, and PC on May 25, 2018. Dark Souls Remastered for Switch was announced during the January 2018 Nintendo Direct and was due on the same date as the PS4, Xbox One, and PC versions, but has been delayed to the summer. This delay applies only to the Switch version of Dark Souls Remastered and the Solaire amiibo. No firm release date has been given for the Switch version. Confirmation of Dark Souls Remastered for the PS4, Xbox One, and PC versions came from a tweet from Bandai Namco. Check out our list of Dark Souls guides just below, which we'll be updating over the coming few days to bring you bosses and hidden details from deeper within the game. All versions of Dark Souls Remastered are set to cost $40, with a listing on Amazon.com confirming the price across all platforms. Bandai Namco has confirmed that PC owners of the original Dark Souls Prepare to Die Edition will be able to upgrade to Dark Souls Remastered at a discounted price. Pre-order Dark Souls Remastered on PS4, Xbox One, PC, or Switch. One question many Dark Souls fans are asking is, "who is making Dark Souls Remastered?". While Bandai Namco has stated it's in development at From Software, the original development team and creators of Dark Souls, Kotaku UK News Editor Laura Kate Dale has said that another team is handling most of the work. According to Dale, QLOC, a dev studio that has ported numerous games to new platforms, is working on Dark Souls Remastered on PS4, Xbox One, and PC to "some major degree". It's not clear if the studio is also helping out with Dark Souls on Switch. Dark Souls Remastered Switch - What do we Know? While the Switch version of Dark Souls Remastered is slightly improved graphically over the previous Xbox 360 and PS3 versions, it's not a huge leap. Dark Souls Remastered on Switch is said to include all the Artorias of the Abyss DLC, plus improved frame rate and resolution compared to the original release. Dark Souls Remastered on Switch will run at 30FPS in docked or portable mode. In portable mode it will run at a resolution of 720p, with that rising to 1080p in docked mode. The Switch version of Dark Souls Remastered is reportedly in development at Virtuos, the team that brought LA Noire to current-gen systems. To celebrate the arrival of Dark Souls on Switch, a special Solaire amiibo is being released. 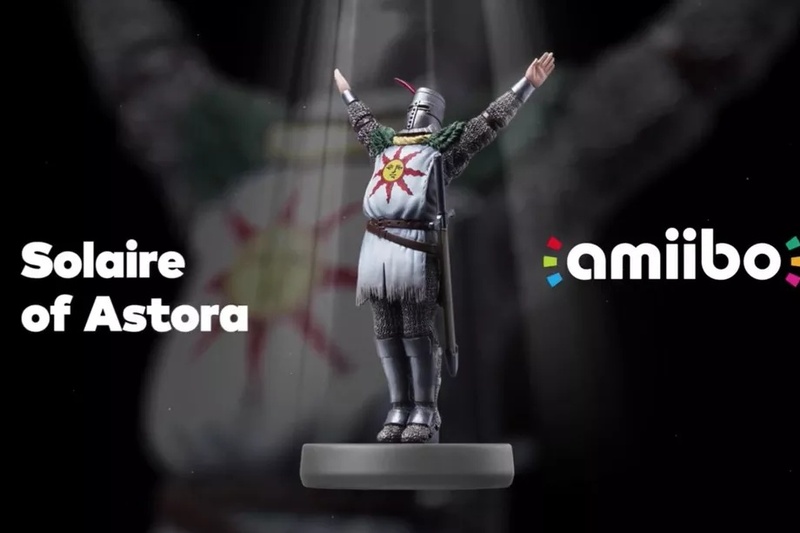 by using the Solaire amiibo, players will be able to use the 'Praise the Sun' gesture from the start of the game. Presumably you'll be able to unlock this gesture through normal play, too. In terms of new features, Dark Souls Remastered will include multiplayer support for six concurrent players and dedicated servers - according to the PlayStation Blog. With press getting hands on time with Dark Souls Remastered on Switch, there's no plenty of footage showing off the game running in handheld mode. Take a look at the cammed footage below to see how Dark Souls performs on Switch. Players hoping to be able to sample Dark Souls Remastered ahead of its release via a demo are in luck. During the March Nintendo Direct a Dark Souls Remastered Network Test was announced (which is more or less another name for a demo), and will allow Switch owners to try out Dark Souls Remastered ahead of its release. Bandai Namco confirmed later that the Dark Souls Remastered Demo/Network Test is also coming to PS4 and Xbox One. Although a lot of the hype surrounding Dark Souls Remastered is around the fact you'll be able to play it on the portable Switch, the PS4, Xbox One, and PC versions look like being the bigger remasters. As well as all the feature enhancements found in the Switch version, PS4, Xbox One, and PC owners will reportedly be able to play the classic game with new lighting and effects (similar to those in Dark Souls 3), plus improved textures. The very first footage of Dark Souls Remastered running on PS4 Pro has been released, and can be seen below. Differences between the PS4/Xbox One and Ps4 Pro/Xbox One X versions are expected to be minimal outside of resolution. Digital Foundry put the final version of Dark Souls Remastered through its paces, looking in detail at Blighttown. As you can see from the video below, the frame rate has been massively improved, meaning you can play through this area without any issues for the first time (barring play ona high spec PC). Our friends at Digital Foundry have been taking a look at Dark Souls Remastered and comparing it to the original Xbox 360 release to see just what has changed. The video below reveals all. As you can see, outside of the huge resolution increase and the smoother 60FPS, there aren't a load of graphical enhancements to speak of. Things have been tweaked here and there, with some textures being improved, but this isn't a complete overhaul like we saw with Shadow of the Colossus on PS4. Will Dark Souls Remastered run at 60FPS and in 4K on PS4 Pro and Xbox One X? Dark Souls Remastered on PS4 and Xbox One are said to run at 60FPS at a resolution of 1080p. The resolution is reported to be 'upscaled' to 4k on PS4 Pro and Xbox One X, with the enhanced consoles also supporting HDR - the inclusion of HDR has been the subject of some mixed messages, so it's currently not clear if the game will include it or not. If you were hoping that Dark Souls Remastered would feature cross-platform play, perhaps letting PC players battle with Xbox One or PS4 players, sadly that won't be the case. Bandai Namco has confirmed that Dark Souls Remastered won't include cross-platform play. While the dream of the Dark Souls trilogy coming to Switch is still just a dream at the moment, a lovely Dark Souls trilogy collection is coming to the PS4, at least in Japan. This great looking set can be yours if you are willing to pay a lot of money for it! 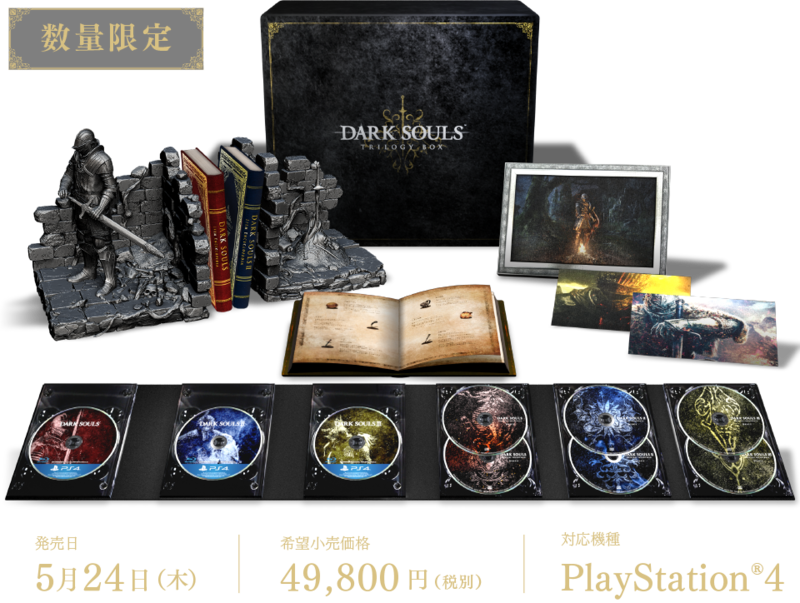 The Dark Souls trilogy box set will cost 49,800 yen (or ~$446.70) and includes all three Dark Souls games (including the Remaster), a six-disc soundtrack collection, Dark Souls-themed bookends, a collector's book, and some art prints. 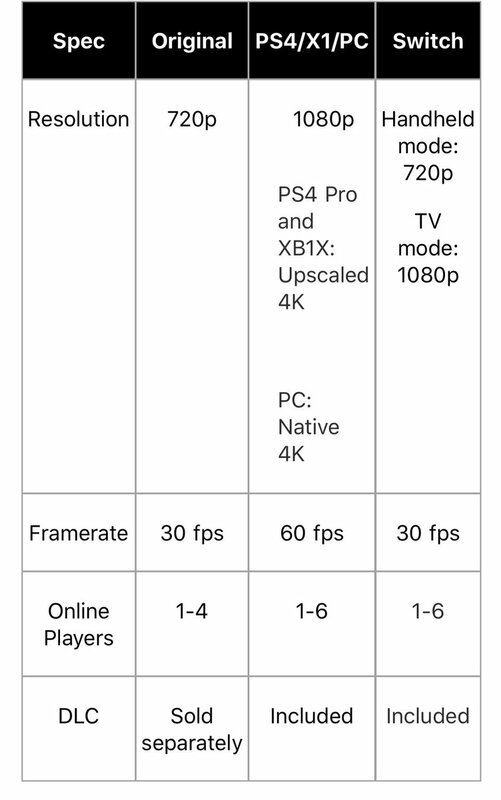 Switch – 1080p resolution at 30fps when docked to TV. 720p resolution at 30fps when in handheld mode. Dried Finger has been moved from the Painted World of Ariamis level to the Undead Burg merchant to be obtainable earlier in the game. The Dried Finger location in the Painted World has been replaced with a Twin Humanities item. Password Matchmaking is now available similar to Dark Souls III. When a player is summoned in Password Matchmaking the player level will be synced. Now easier for friends to be matched with each other. When the guest player's character level and weapon is higher than that of the host player, the level will be adjusted accordingly. Healing items will not be available during PvP with the exception of Estus Flasks. To prevent long and drawn out battles, the number of Estus Flasks is halved for phantoms. When a player defeats an invading phantom, their Estus Flask is restored. Players can no longer summon ally phantoms consecutively when in combat with enemy phantoms. In online play, players who are outside of the host's parameter range will not be matched with each other (the players can still be matched via Password Matching. 3v3 and 6-player deathmatch have been added. Arena battles can also use Password Matching. Players can select the number of usable items, such as consumable souls or covenant items, to use instead of one at a time as in the original game. The number of languages has been increased to the number found in Dark Souls III. Virtuous is developing Dark Souls: Remastered for Nintendo Switch and QLOC is handling development for the PS4, Xbox One, and PC. FromSoftware is taking on a supervising role for the title. When the up or down directional pad button is held down, the first item equipped will be selected. The online network has been changed from P2P to dedicated servers. 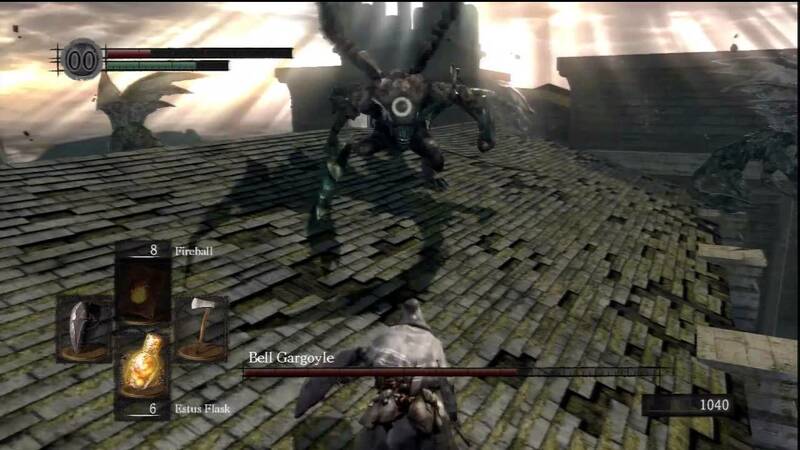 We hope you're ready to take on the Bell Gargoyle all over again. That brings an end to all the information you need on Dark Souls Remastered, but we'll be sure to update this guide when Bandai Namco details the final release date of the Nintendo Switch version of the game.